We present to you the Aqua Pro. A superior product designed inside and out. Made to the highest standards for the best customer experience. Aqua Pro features a 1.8 inch thin uni-body enclosure, carved from a single solid block of aluminium. Created by computer controlled CNC for numerical engineering precision. Inside and out we make use of environmentally friendly materials to minimize the environmental footprint. You have never seen an aquarium light like quite like this one, built to make any aquarium owner proud. A removable panel at the bottom makes cleaning inside completely painless. Once you're inside you will see how clean and organized the Aqua Pro is. It also features a ultra silent cooling fan that you will barely hear when running. The Aqua Pro comes with a variety of settings: the timer, the set LED (white, blue, or special led), special effects (sunrise, sunset, thunderstorms), demo and factory reset. You can use the "demo" setting to go through all the settings in 1 minute or you can reset your Aqua Pro to its initial default state by choosing "factory reset". Furthermore Aqua Pro has 3 LED-channels each of which can be set separately. The Aqua Pro can be installed in three different configurations using the enclosed super bracket, the hanging kit and the connector parts . As it is designed for maximum flexibility the installation kit fits fish tanks of almost all sizes. Anyone ready for some serious reef fun? We use a combination of 80 and 100 degree reflectors to penetrate the deepest tanks and to also provide greater coverage. Our independent refraction optic design provides full light coverage for your tank. The newly announced MPR - Magnetic Probe Rack is the perfect product for anyone with an existing Apex or those just now picking one up. The MPR has four locations for probes so customers can rig up their pH, ORP, salinity, and temperature probes. And, it is the only probe holder on the market that has a hole large enough to accept the Apex temperature probe from the top. 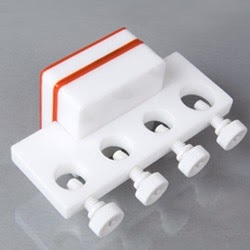 The magnets are incredibly strong and will easily hold the MPR to the side of thickest of sumps (up to at least 1/2"). It is stylishly designed and priced on par with other probe holders on the market at $39.95.